The Cadence® Allegro® PCB Designer enables efficient manufacturing collaboration through IPC-2581, an open, neutral, global standard developed to communicate PCB build intent to manufacturing. Cadence believes it is in the industry’s best interest that an open, public, neutrally maintained standard be adopted by all segments of the PCB design, fabrication, assembly, and test supply chain. Cadence commits to developing and maintaining IPC-2581 import and export from its Allegro and OrCAD® PCB Designer software and to staying current with the latest approved and published IPC-2581 specifications. With Allegro PCB Designer’s support of the stackup exchange, you are able to build intent collaboration with your fabrication partner. Data now embedded in IPC-2581 file includes layer structure, layer stack sub-groups, materials definition, dielectric materials, conductive materials, coatings, and material characteristics. Stackup defined and analyzed by manufacturing experts can be imported into Allegro PCB Editor, eliminating manual entry. 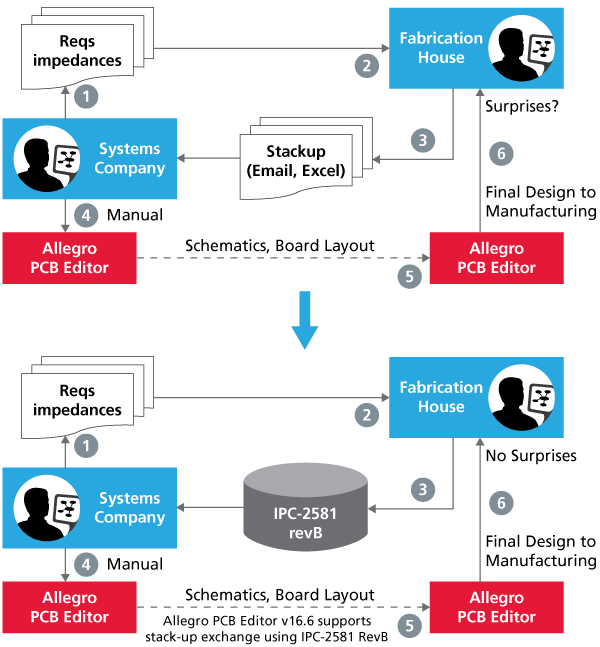 Allegro PCB Designer supports export and import of IPC-2581 Revision A and Revision B. The IPC-2581 data is passed in a single file that creates accurate and reliable manufacturing data for high-quality manufacturing. Users have a choice to export a subset of the design data for protecting their IP. Import of IPC-2581 is intended for overlaying artwork data on the design for viewing purposes only. Cadence is a founding member of the consortium for supply-chain adoption of IPC-2581. IPC-2581 specifies the XML schema that represents the intelligent data file format used to describe PCB and PCB assembly products with details sufficient for tooling, manufacturing, assembly, and inspection requirements. This format may be used for transmitting information between a PCB designer and a manufacturing or assembly facility. The data is most useful when the manufacturing cycle includes computer-aided processes and numerical control machines.